How to create dashboard report with Clickmeter? ClickMeter is a marketing links management system used to easily track views, clicks, and conversions from your links around the Internet. Since DashThis has its native integration, you can create dashboards and reports using your ClickMeter data today. In order to connect DashThis to your ClickMeter data, go to the Integration Manager. 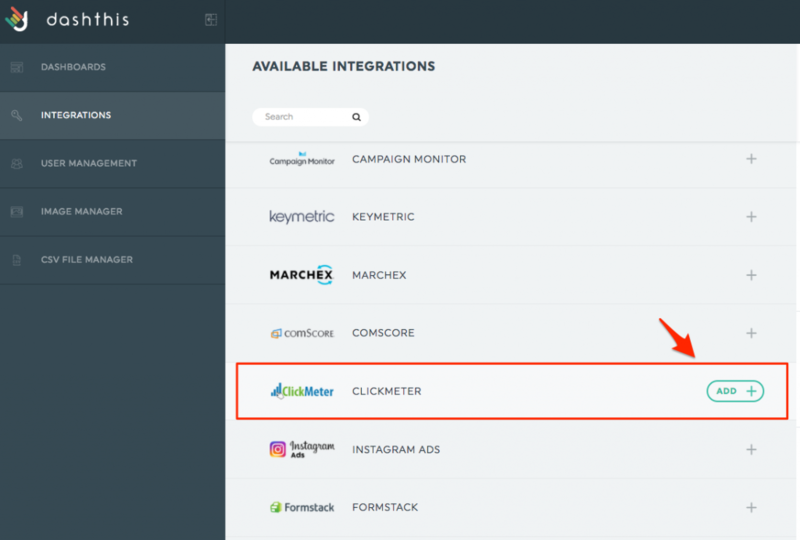 Find Clickmeter among the available integrations, and click on Add. Account name: The name want want to use to identify this account. Click on Add, and you’re done! There are no dimensions available at this time. This entry was posted in Integrations and tagged ClickMeter, Managing Integration. How to create reports and dashboards using the Keymetric Call Tracking API?